An annual trip to Disneyland Paris for fursuiters and friends will not occur in 2012, says event organizer Timduru. 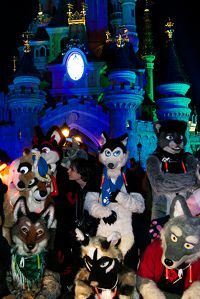 Fursuiters have taken trips to Disneyland since at least 2003; the event attracted 60 fans in 2011. The status of amateur costuming in Disney theme parks around the world is mixed. Florida's Disney World has been known to turn a blind eye; California's Disneyland does not. Despite the setback, French fursuiters can still attend several events, including Timduru's own Meerkat Manor dances (video - more). I wonder if the Aurora Colorado shooting has factored into Disney not allowing full prop costumes, or at least ones covering their head as many theaters have done. Granted their two different venues, but it might be in their interest to "protect" those that go into their parks. It probably is a safety concern, but I doubt the French would do it based on an event half the globe away. I dunno. I heard someone saying they increased security even at some cinemas over here, and other countries too, in case there were copycat shootings. It makes no sense of course as it was one deranged individual but people are hardly rational creatures. But to my knowledge is done for safety reasons. There are many places where it is illegal to cover your face in public because it prevents identification, something that would be very east for a criminal to abuse. They probably had this new policy because Non-Disney animal characters would get more attention than Disney characters. If I was at Disneyland and a Fox character who is not Robin Hood was there. I would probably pay more attention to him than Mickey Mouse. They will just have to rather stick with Disney characters. This is actually French law that was passed to ban the wearing of religious headgear, hoodies and caps and also tangentially and presumably unintentionally fursuitters. Solve a Mystery. Re-Draw History. What dream film would you want first?